From the sweeping door handles to the concealed hinges and contemporary French-Door design, this leading model from Whirlpool is an example of the perfect marriage between modern design and robust engineering. 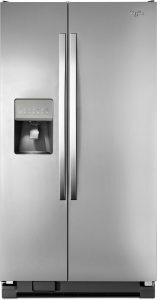 The tech features built into this refrigerator belie the mid-level price range, while the ENERGY STAR rating ensures continual low-cost operation for years to come. 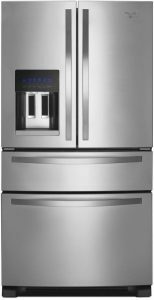 Whirlpool is a legacy appliance maker for a reason, and this model represents one of the finest values in a French Door fridge on the market today. A flexible interior space and thoughtful design cues create a compelling value proposition for the discerning, though budget-conscious shopper. Whirlpool crammed so many unique and useful features into this popular model and still kept the price point within range of most consumers. The 4-Door French Door configuration maximizes interior space, while unique tech features like a measured fill system and Adaptive Defrost represent how Whirlpool actively integrates intuitive and thoughtful cues into its line of refrigerators. We love this model for its striking good looks and capacious interior. * 24.7-cubic-foot capacity is ideal for growing families or budding culinary masters, alike! Artful yet tasteful design features combine with innovative tech offerings to create one undeniable value in a 4-door French Door refrigerator. This value-priced model from Whirlpool delivers counter-depth style and a bevy of handy features to create a powerful value proposition for today’s style-conscious appliance shopper. The counter-depth design lets this fridge sit flush with most contemporary kitchen cabinets – creating a built-in look that is undeniably attractive. And, the ENERGY STAR rated components operate smoothly, quietly and economically. 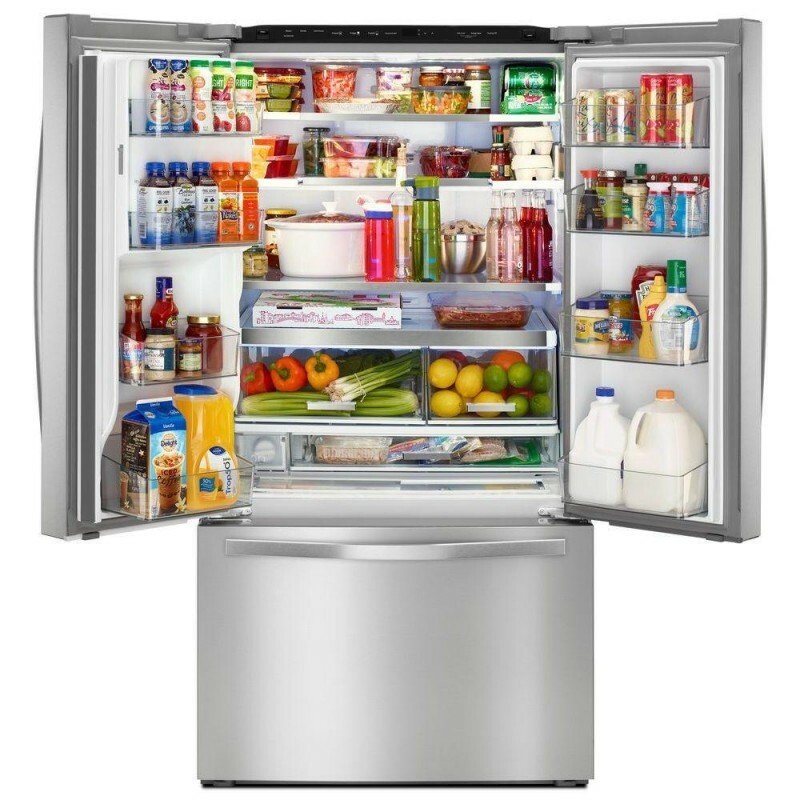 Side-by-side refrigerators offer convenient and reliable performance, year after year – and this particular Whirlpool model is a perennial favorite because it blends a modest price point with robust feature content. If you’re in the market for a contemporary, stylish and reliable side-by-side, add this Whirlpool to your list of possibilities! 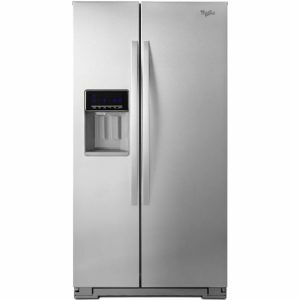 Leave it to Whirlpool to cram so many performance and convenience features into one sleek and stylish refrigerator – than price it below most comparable models on the market today. This stylish fridge offers terrific interior capacity and a flexible design that makes the most of the 25.4 cubic-foot size. LED lighting is soft and soothing, and draws almost no energy while in use. And, the PUR water filtration system and EveryDrop Water Filter deliver clean, great-tasting water – drop after drop. Whirlpool again redefines the notion of value with their elegantly designed WR-series of side-by-side refrigerators. This model is ideally-suited to the needs of budget-conscious shoppers who appreciate artful design and reliable performance. 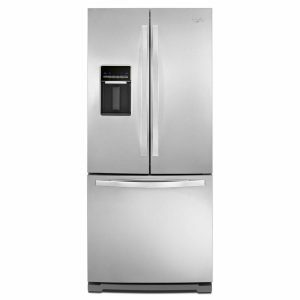 Whirlpool delivers plenty of convenience and performance features in this 33-inch side-by-side, and the sleek exterior design and modest price point combine to create an unbelievable value in a modern fridge. * LED lighting imbues the interior space with soft, soothing light that is energy-efficient, too! Value-conscious shoppers love the way this Whirlpool fridge looks and performs – all while commanding a lower cost of entry than most competitors today. Whirlpool is a legendary appliance manufacturer, and there is a reason why it has earned a reputation for incredible value, performance and design. The five top performing Whirlpool models above are leaders in their segment and represent terrific choices for today’s discerning appliance shoppers.